Schwartz & Wade Books, 9780375835964, 32pp. This "Parenting Magazine" Best Book of the Year and Bank Street College of Education Best Children's Book of the Year features a kid full of fun ideas. For example, in the morning, gluing her brother's bunny slippers to the floor sounds like a good plan. But now she's not allowed to use glue anymore. And what about when she shows Joey Whipple her underpants--they're only underpants, right? Turns out she's not allowed to do that again, either. And isn't broccoli the perfect gift for any brother? It's just too bad her parents don't think so. But she has the last laugh in this humerous picture book about not-so-great behavior. 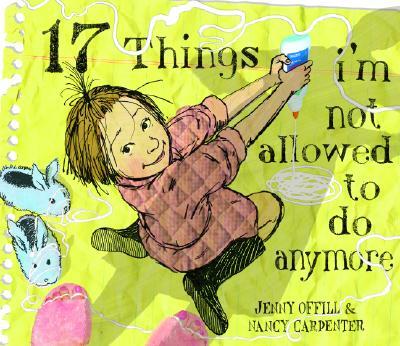 And don't miss the companion book to "17 Things I'm Not Allowed to Do Anymore: ""11 Experiments that Failed," a zany exploration of the scientific method by everyone's favorite troublemaking protagonist. Jenny Offill is the author of "17 Things I'm Not Allowed to Do Anymore, " a "Parenting" Magazine Best Book of the Year and a Bank Street College of Education Best Children's Book of the Year, and "11 Experiments That Failed, " also a Bank Street College of Education Best Children's Book of the Year, which "Kirkus Reviews, " in a starred review, called "the most joyful and clever whimsy. "Nancy Carpenter is the illustrator of "11 Experiments that Failed" by Jenny Offill; "Imogene's Last Stand" by Candace Fleming;" Loud Emily" by Alexis O'Neill"; Fannie in the Kitchen" by Deborah Hopkinson; "Apples to Oregon" by Deborah Hopkinson, an ALA Notable Book; and "Sitti's Secrets" by Naomi Shihab Nye, winner of the Jane Addams Picture Book Award, among other books. She lives in Brooklyn, New York.